Three muggers – one armed with a firearm – stole mobile phones and other personal effects from the victims in two separate robberies within five minutes, before driving off, police said. “The first occurred at 5.15am on the corner of Fairview Road and Gordon Road. The victim was waiting to be picked up for work at the time. On average,1500 aggravated robberies and other violent crimes occur in NZ each day, but only a tiny fraction of the incidents are reported. “Police are investigating the aggravated robbery of the Queen Street Pharmacy in Upper Hutt on Sunday 7 October. A man entered the store’s Andrews Lane entrance at 7.10pm and confronted the two employees with a large knife. The man threatened the employees and demanded prescription medications. Immigration NZ says it identified 1842 cases of suspected serious crime in the 2017/18 financial year, but was unable to investigate 1195 of those cases, mostly due to a “lack of investigative resource”. A male diver died at the beach near Puketapu Road, Pihama in Taranaki this evening. Another highly suspicious death “not suspicious,” police say! “Canterbury Police say the death of a 44-year-old man in Waimate over the weekend is not suspicious. Demand for donkey dongs and $1m homes in Rotorua increasing !!! If you’re really looking for a $1m home in Rotorua, then you must be into donkey dongs! Professionals McDowell Real Estate claim the demand of $1m properties had grown within the past two years, a report said. Based on information they say they obtained from the Real Estate Institute of New Zealand, between January to the end of May, 12 residential properties or apartments had sold in Rotorua for more than $1m. A 4-bedroom, 3-bathroom home on Spencer Rd, near Lake Tarawera priced at $1,450,000, is currently one of five properties priced over $1m. And there’s no tax for the powerful smell of fart in the area. “It smells like someone farted in your face all the time,” said Steve Adams the basketball player. Rotorua: it smells like farts. I can see why they went with a different motto but this is more honest. Based on information received from local sources, at least 4 dozen armed robberies have occurred in NZ since August 1. A man on a unicycle was hit and killed by a truck this morning on Onehunga Mall. The man on the unicycle was killed instantly. This is New Zealand: Do NOT take your eyes off the kids! A 17-year-old man has been arrested in relation to the kidnapping of an 18-month-old child overnight, police said. The toddler, Elisaia Kiff, was reported missing from his Koutu home, Rotorua, but was found around 8.15 this morning and was apparently uninjured. The kidnapper is not known to the family, they said. ‘Messey’ University chancellor should be replaced by a cow! The stupid c*nt should be replaced by a cow! Family of Nick Evans, 25, continue fight for justice over son’s [murder] on June 18, 2015 while he was in Corrections custody at Northland’s Ngawha Prison. Rising values in Rotorua property market saw a whopping 27.7 per cent jump since last year. The average current value for a house in Rotorua was $372,849, according to the QV House Price Index for November, released earlier today. Nationwide, residential property values for November increased, yet again, by 12.4 per cent over the past year, to $624,675. The median home value in the United States is US$191,200. United States home values rose by 6.2% over the past year. The median rent price in the United States is US$1,550. The median home value in Los Angeles is US$597,100. Los Angeles home values have gone up 8.2% over the past year. Does Rotorua really smell foul? One person was killed and another injured in a quad bike crash at Kuratau near Taupo [Bay of Plenty of Deaths] near State Highway 41 at about 1.00am. Three people have been injured in a head-on crash on State Highway 1 near Paekakariki this morning. The female driver of one of the cars involved in a crash was airlifted to Wellington Hospital with critical injuries. Rotorua area commander Inspector Horne sticks to his guns: The right to use police car as a lethal weapon! A senior police officer accused of being in a driving incident in his police car could lose his licence, and possibly his job, if he fails to overturn his latest driving infringement notice. Bush refused an interview. And Horne would say only that it was not related to speeding and he still carried a full licence. “It’s an issue between me and some other people and is not public information. I have nothing more to add,” he said on Saturday. Police have been very reticent to disclose details of the June incident. They refuse to say when it happened, where it happened, what type of driving offence he was accused of, or what other people were involved. West Coast rugby player Brogan Watt, 23, remains in a coma after undergoing emergency brain surgery after losing to Poverty Bay in Greymouth on Saturday. He is the umpteenth NZ pro to receive fatal/near fatal injuries while playing violent sports in recent months. The man who was killed in a crash in Wallacetown on Wednesday 28th of September was 21-year-old Mark Algodon, police said. Johnathan Madera, 50, was killed instantly when the quad bike he was driving crashed into a fence at a farm on Blackford Road, Mount Hutt, in Ashburton. Another murder-mystery, or medical event? Police say they have found a body inside a car stopped on the side of the Wellington motorway. The car was parked beside State Highway 1, northbound near the Churton Park off ramp at 7.45am on Thursday, police said. They immediately ruled out foul play and stated the stiff was apparently being killed by a “medical event”. Scott Dalziell, a former Lower Hutt councillor, who was seriously mauled by a bull mastiff-cross in Naenae, was killed in a car crash. Dalziell was described by a friend as a committed socialist with a strong social conscience. Dalziell strongly opposed the sale of council-owned rental properties, arguing that the council had a responsibility to the socially disadvantaged. Tipiwai Stainton, 29, was killed in OceanaGold’s Correnso underground mine at Waihi Thursday night. Blog estimate: About 900 people are killed on NZ roads each year. 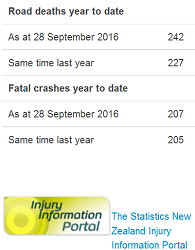 [Most probably] up to 527 road fatalities have occurred in NZ since 1 January 2016. Police in Rotorua have shot a man in the chest and seriously injured him, according to MSM reports. 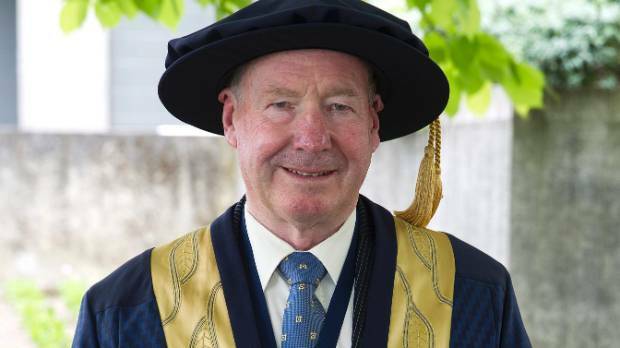 Bay of Plenty District Commander Superintendent McGregor said the man was in a critical condition, said a report. However, eyewitnesses say the man was probably dead when the ambulance arrived. The attempted execution was the third police shooting in under five weeks. Paeroa man Mike Taylor was “shot in back” by police assassins on June 10. His partner is demanding a public inquiry after watching him murdered by armed police. Pera Smiler, 25, was executed by police in a busy Upper Hutt street on September 7, 2015. Ford Hurunui, 27, was shot and critically injured by police at Motueka on August 20, 2015. David Cerven, 21, from the Slovak Republic was executed by NZ police on August 2, 2015. Vaughan William John Te Moananui, 33, was executed by police in Thames on May 2, 2015. Caleb Henry, 20, died in hospital in July 2013 after being shot in a police chase. Adam Te Rata Charles Morehu, 33, was executed by armed police in June 2013. Lachan Kelly-Tumarae, 19, was executed by a police assassin in 2011. The assassin fired 14 shots hitting victim four times and fatally wounding him. Paraplegic Shayne Richard Sime, 42, was executed by armed police in Burnside June 29, 2009. Jan Molenaar was executed by armed police and/or NZ SAS at his home on May 9 , 2009. As was totally expected, the Independent Police Conduct Authority decided not investigate police actions that led to the armed siege of Molenaar’s home in Napier because, you guessed it, “he shot himself [sic]”. Molenaar had been unhappy with police because they had a racist attitude towards his Maori partner, a local teenager told reporters. Halatau Naitoko, 17, shot “accidentally” by criminally negligent armed police during a pursuit on the Northwestern Motorway in Auckland January 23, 2009. British woman Lee Jane Mettam, 37, was executed by a member of the AOS on October 23, 2008 after she allegedly held up staff in a Vodafone shop in Reyburn Street in Whangarei with an airgun. Stephen Jon Bellingham, 37, was executed by armed police in Stanmore Road, Avonside September 26, 2007. Jason Williams, 32, was shot by police in Avonside Dr after a car chase November 21, 2001. Steven Wallace was shot by Senior Constable Keith Abbott in the main street of Waitara, Taranaki on April 20, 2000. Haidar Ebbadi Mahdi, 37, was executed by armed police who shot him in the head as he allegedly stabbed his wife being held in a headlock in a South Auckland house on Saturday August 14, 2004. Steven Wallace, 23, of Waitara, was executed by police after an alleged window smashing spree in the town April 30, 2000. Edwin Leo, 31, was exeuted by police assassins near Helensville, Northland, following a car chase July 1, 1999. James Raharuhi executed by a single police bullet at a service station in Greenlane, Auckland September 21, 1996. Terence Thompson was executed by police assassins in a Havelock North Orchard. Thompson was suspect in the slaying of Constable Glenn McKibbin (June 24, 1996). Barry Radcliffe was executed after allegedly taking a rifle from a sporting goods store in Whangarei November 20, 1995. Eric Gellatly was executed by police in Invercargill, after he allegedly took over a sports shop in the central city and began firing indiscriminately on September 28, 1995. Larry Hammond was executed by police thugs who shot him at least three times in the Morrinsville police station on July 29, 1993. Members of the anti-terrorist squad shot David Malcolm Gray after he killed 13 people at Aramoana, Otago November 14, 1990. Paul Melvin Stowers was executed by a police detective who shot him in the forehead claiming the victim had threatened him with a shotgun in Newmarket, Auckland on October 27, 1990. Benjamin Wharerau was executed by police after he allegedly took a hostage in a robbery of a Dargaville bank on March 14, 1986. Kevin David Fox was executed by police after he allegedly killed his wife in a car in Gore on June 6, 1985. Paul Chase shot by the armed offenders assassination squad in a raid on a Petone, Wellington flat on December 24, 1982. John Edward Morgan was executed near Wainuiomata, Wellington, after he allegedly threw an axe at police on December 24, 1982. Nicholas Panayi was executed by the armed offenders assassination squad outside his Henderson, Auckland, home after a domestic dispute on May 20, 1979. The armed offenders assassination squad executed Daniel Houpapa after allegedly fired at an officer in Taumarunui on October 4, 1976. 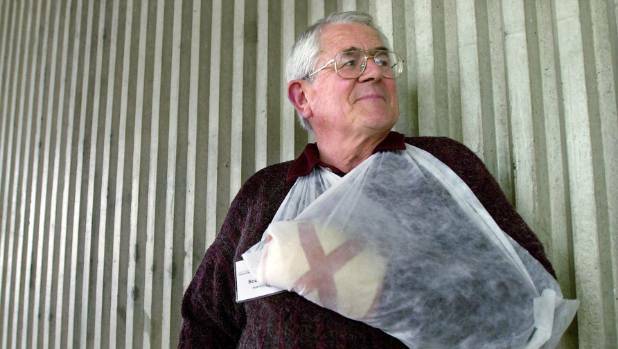 Edward Ross shot by the armed offenders assassination squad as he stabbed his daughter after escaping from a Christchurch psychiatric hospital in 1975. April 16, 1970. Bruce John Glensor, holding two hostages in a Wellington house shot by the armed offenders squad when he allegedly threatened to shoot a policeman on December 14, 1949. Waata Haremia Momo swas executed in Weedon, Canterbury, after allegedly exchanging shots with police, December 14, 1949. West Coast farmer Eric Stanley Graham was executed after shooting three policemen and three civilians, October 20, 1941. The driver of the southbound car, described as being “in her 20s”, died at the scene. A heavily pregnant woman and her husband were injuried. Relatives of a young boy critically injured in a bus crash have flown from China to Christchurch to be at his bedside. The boy was among 16 people hospitalised after a bus carrying a Chinese tourist group collided with a car in Otira Gorge, near Arthur’s Pass, on Thursday. This blog is NOT anti-Chinese. Information posted on this blog can save Chinese lives. Why then is this blog banned in China, other than to protect the interest of corrupt officials who gain handsomely from the tourism industry? In what way is your administration any different from the previous corrupt government in the PRC? 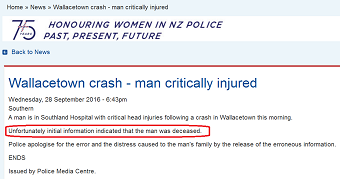 Inspector Kevin Taylor, Bay of Plenty [of Deaths] Police, visited the scene of Atiamuri crash that caused multiple fatalities. No chance! 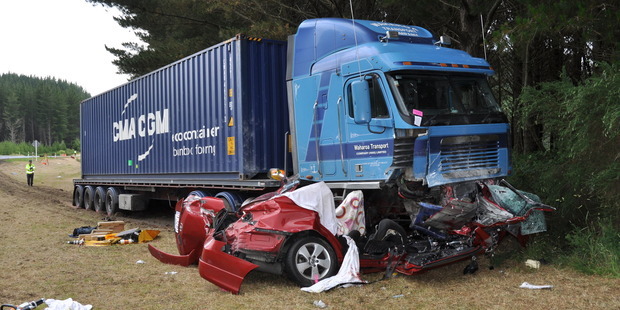 Heavy truck squashes car, killing three people. Photo/John Van De Ven/NZ Herald. Photo may be copyrighted. The crash occurred on State Highway 1 at Atiamuri, just south of the intersection with SH30, at around 2:15pm, police said. A 45 year male scuba diver [possibly an overseas visitor] has been found by another diver on the sea floor near Red Rocks Wellington at approximately 2.50pm this afternoon. The crash has occurred on the Kilmog Hill north of Evansdale late Friday. 2 cars and two trucks have been involved in the crash. Police are currently dealing with an incident in the Western Heights area of Rotorua. Two adults have been injured and taken to hospital. Spanish Judge Jose de la Mata has issued an arrest warrant for the Israeli PM Benjamin Netanyahu over the deadly attack by IDF on the Gaza Freedom Flotilla in 2010 that killed ten people, according to a report. 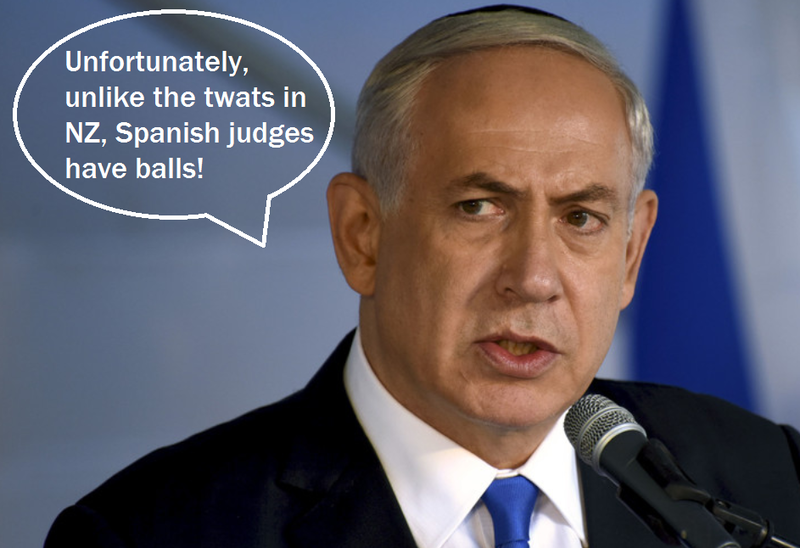 Crimes against humanity: Mr Netanyahu and six former officials would be arrested if they set foot on Spanish soil. The Freedom Flotilla aid ship Mavi Marmara, which was trying to bring supplies to Gaza during an an Israeli-imposed blockade, was attacked by Israeli Defense forces (IDF). Nine activists were killed during the raid that occurred in international waters, about 150km from Gaza, and one more died of wounds a week or so later. Nine of the Turkish victims were killed with 30 bullets including five who were shot in the head at close-range, autopsies revealed. Arrest warrants have also been issued for six other Israelis including ex-defense minister Ehud Barak, ex-foreign minister Avigdor Lieberman, ex-deputy prime ministers Moshe Ya’alon and Eli Yishai, former state minister Benny Begin, and Israeli Navy commander (2007-2011) Aluf (Vice Admiral) Eliezer “Eli” Marom. Sent by a reader in the world’s smelliest city [aka, the rotten eggs city, Sulphur City, and Rotorua] – Edited by Moderator B. Popular film director Quentin Tarantino said he will not apologize to the police for the frank comment he made earlier despite threats of boycott by police unions. “What I said was the truth,” he said. Police unions in Chicago, Houston, Los Angeles, Orange County, San Jose, New York, New Jersey and Philadelphia have joined in the call to boycott Tarantino’s upcoming film The Hateful Eight. “What they’re doing is pretty obvious. Instead of dealing with the incidents of police brutality that those people were bringing up, instead of examining the problem of police brutality in this country, better they single me out. And their message is very clear. It’s to shut me down. It’s to discredit me. It is to intimidate me. It is to shut my mouth, and even more important than that, it is to send a message out to any other prominent person that might feel the need to join that side of the argument,” Tarantino told the LA Times. Tarantino could easily have been describing NZ police’s murder squads—the trigger happy thugs who murder unarmed civilians with impunity, and their commanders who absolve the murderers. Police refused to say whether the infant was a boy or girl. There will be no further information available while officers were conducting their initial inquiries, they said. Bay of Plenty of Deaths: a tourist reportedly discovered the body of an adult in a hot pool at Rotorua’s Kuirau Park Tuesday afternoon and alerted the police, said Senior Sergeant Karl Konlechner. Earlier police had said getting the body out of the pool would be very difficult. “We are yet to confirm that there is a body in the pool, but we are working on that assumption,” a report quoted the Rotorua police area commander Inspector Bruce Horne as saying. In a later bulletin police admitted that the initial rumors were in fact correct and that a body had been recovered from the pool. “The death is being treated as unexplained at this stage,” police said. Concern is growing for the welfare of missing Indian student Mandeep Singh, 20, who hasn’t been seen for more than two days. Mr Singh was last seen at Viaduct Harbour on Sunday morning at around 3am, police said. 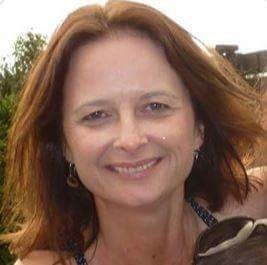 “At this stage we have had no sightings of him after he left Burngalow 8 bar at around 3am on Sunday morning and we would ask anyone who may have been in the area at the time and might have seen Mandeep to please contact us on (09) 302 6557,” said Acting Detective Senior Sergeant, Marcia Murray. “We are keeping an open mind about his disappearance and searches of the area have continued today including a search of the waterways around Viaduct Harbour, Auckland City. 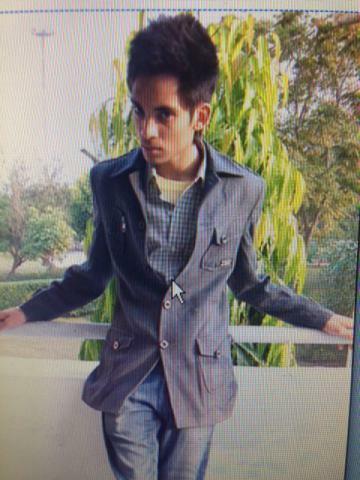 “Mandeep’s family are deeply concerned about his disappearance and our focus remains on trying to find him,” she added. Mandeep Singh, 20, was last seen by his friends at 3am on Sunday morning after leaving the Bungalow 8 Bar in Viaduct Harbour, Auckland City. He was wearing a blue collared shirt, blue jeans and black and white shoes and is described as slim build, with brown hair and brown eyes and around 5’8″ (170cm) tall.